Employment in the Atlantic Seaboard states rose by just over one million jobs in the last twelve months, ending May 2016 (the most recent regional data available in mid-July). Unemployment, at 4.8%, was just a little below the U.S. average of 4.9%. West Virginia had the highest jobless rate, at 6.2%, followed by South Carolina, at 5.6%. Virginia (3.8%), Delaware (4.1%), and Maryland (4.5%) achieved the lowest levels of unemployment. Growth in the Southeastern states (from Delaware through Florida) was 2.0% in total jobs, slightly faster than the Northeast’s rate of 1.6%. 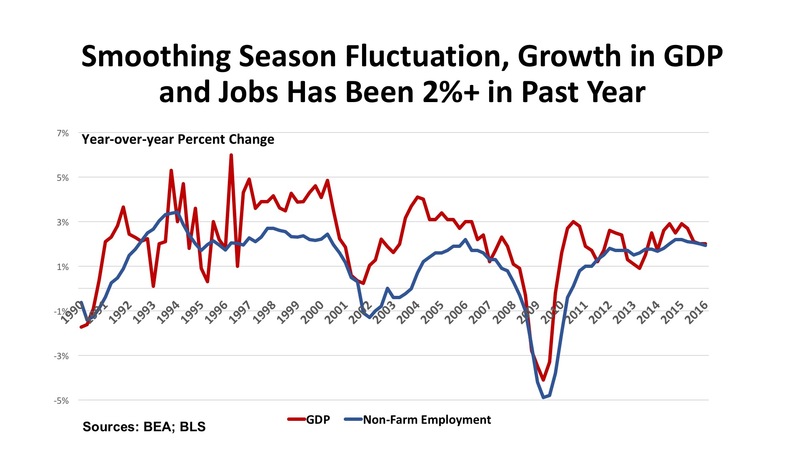 But the overall picture of job change was positive throughout the region. Florida and Georgia set the pace in net job additions. Florida gained 253,900 jobs (3.2%) between May 2015 and May 2016. Georgia’s figures were a 124,600 job increase (2.9%) over the same period. South Carolina posted gains of 2.4% (47,300 jobs), making inroads on its relatively high unemployment rate. The Eastern region finds four states (New York, New Jersey, Florida, and Georgia) ranked in the top ten nationally for global import/export volumes. 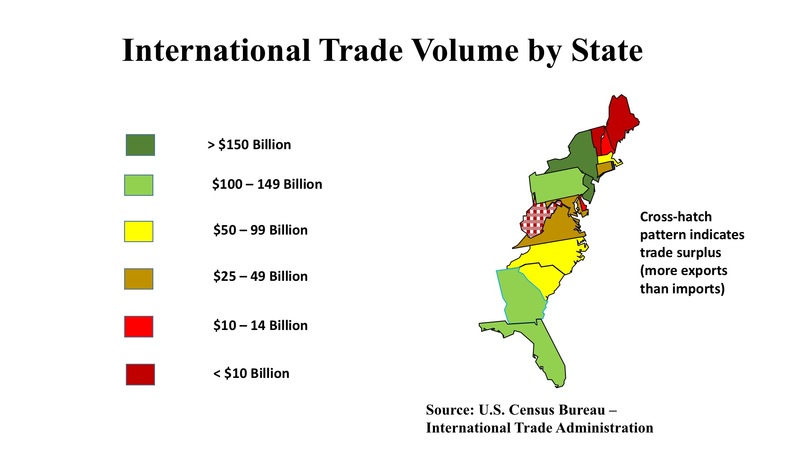 Pennsylvania ranks 11th – missing the top ten by less than $500 million, with $119.1 billion in international trade. Understanding the trade picture is critical for two reasons. Many jobs are linked to trade – in transportation, wholesale and retail markets, financing, and manufacturing. From a real estate standpoint, import/export volumes are key to the flow of goods throughout the logistics chain – a critical source of demand for industrial property such as warehousing and distribution centers. It is no coincidence that ports up and down the East Coast from Miami to Boston prosper in times of strong international trade, as do major distribution points such as Atlanta, Harrisburg (PA), and the Central New Jersey markets around Turnpike Exit 8-A. Some signs that job trends are pushing wages up can be seen. In Virginia, for instance, there are reports that firms lagging in compensation packages are being out-competed for skilled workers. Retailing is stronger in the Boston-Philadelphia corridor than further south. However, the strength of the dollar is causing international travel and tourism businesses in markets like New York City to show some sluggishness. Hospitality markets in the Southeast, on the other hand, that rely on domestic sources of demand, are seeing stronger growth. Although debt capital for permanent loans, whether residential or commercial, remains abundant, construction lending is seeing greater restraint. This is especially true in bank lending. Basel III capital requirements, the regulatory impacts of Dodd-Frank oversight, and the “lessons learned” by banks who were caught with billions of land and development loans in the Global Financial Crisis are all making debt capital for new projects more difficult to come by, especially this late in a cyclical expansion. Office. 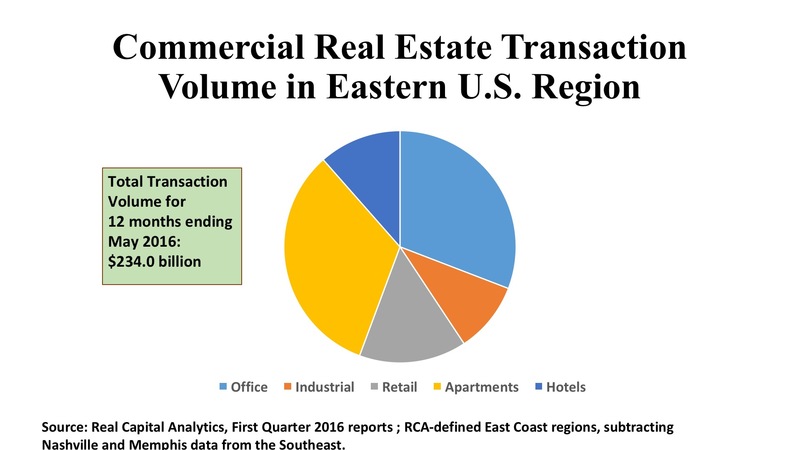 Over the past year, the East has seen offices take the highest percentage of regional sales volume, at 31% of regional investment dollars. Transaction volumes were generally muted in the First Quarter of the year, but rebounded with a solid Second Quarter. This was especially true for CBD properties, which are the mainstays of the major Atlantic Coast cities such as Boston, New York, Philadelphia, and Washington. Between April and June, Manhattan saw no fewer than five office buildings sell for more than $1 billion apiece. Boston and Cambridge, MA each generated sales at more than $600 per square foot. Miami entered the lists with a $220 million office tower deal priced at $348 per square foot. Suburban assets also had solid activity over the Spring quarter, led by sales above $300 per square foot in Arlington, VA and Iselin, NJ. As the economic expansion has lengthened, the search for desirable office assets has broadened far beyond the handful of Gateway markets that dominated early recovery. Industrial. Warehouse and distribution facilities had been enthusiastically viewed as the “coming sector”, as trade volumes soared and ecommerce grew seemingly without limit. However, the first half of 2016 curbed the enthusiasm to a measurable degree. Unrest in the world caused the dollar to soar and a vocal lobby of anti-trade factions sowed uncertainty in this market sector. Investment activity consequently eased moderately, although year-over-year comparisons were skewed by an unusually high level of portfolio or entity-level transactions in early 2015. Single asset industrial sales are down 17% in 2016 across the U.S. as well. 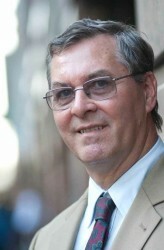 Regionally, key trades involved core properties in core locations. Distribution facilities with excellent transportation access in central New Jersey, along the Pennsylvania Turnpike, and in Maryland and in Charlotte sold for between $55 and $65 per square foot. The impact of ecommerce could be seen in the $105 per square foot price for an Amazon fulfillment center near Bradley Airport in Connecticut. Although investor sentiment still favors industrials, deal pricing may be at a plateau for the time being along the East Coast. Retail. Neighborhood and community centers have sustained transaction volume in the retail sector, as “barbell” conditions limit performance amongst larger shopping malls. The “fortress mall,” or dominant regional/superregional centers are doing extremely well, and there is solid demand for discount centers where the still-stretched household budget can be accommodated. But the middle market is stagnant or worse amongst malls. There is an incredible appetite for grocery anchored centers, though, up and down the East Coast. With yields of 7% on average, and the addition of service-based tenants in the mix of in-line stores, the strip center is clearly revitalized. In Southeast Florida, in the Maryland and northern Virginia Suburbs outside D.C., and in the northern New Jersey and Long Island suburbs of New York, such assets are trading at $250 per square foot or better, at cap rates between 6.5% and 7.0%.